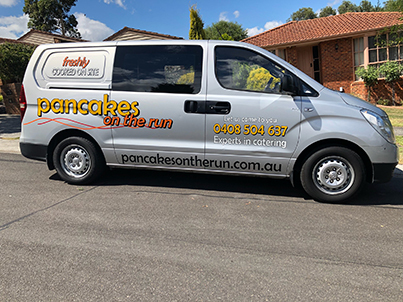 Pancakes are cooked fresh onsite, at any event you may hold ! 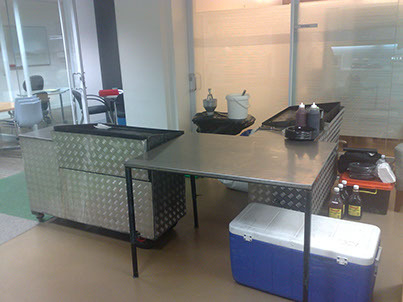 We use gas operated hot plates and are served directly from the hotplate. "Seeing us freshly cook the pancakes is an event in itself ! We have fun doing it, so you will enjoy the experience "
Our equipment is designed to go Indoors or Outdoors. These are just a few examples of the versatility of Pancakes On The Run. We provide Plates, Cutlery and Serviettes for your convenience. We clean up as well, letting you enjoy your function, all at NO EXTRA CHARGE! These are served with ice-cream and your choice of maple syrup, strawberry jam or lemon sugar.